Our organization is a registered 501(c)3 not for profit organization which operates solely on contributions to operate. Membership assists our efforts to some effect however further donations allow us to better further our mission of preserving what we can of the Hagerstown & Frederick Railway and its heritage and educating the public about its importance to the area. All donations to the society are tax deductible. 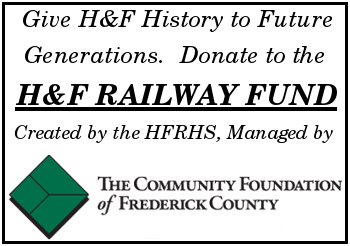 Financial donations may be made directly by check written to the Hagerstown and Frederick Railway Historical Society, or by check or online contributions to the H&F Railway Fund through the Community Foundation of Frederick County. The Society maintains an archive of photographs, documents and small artifacts in Frederick, Maryland. We accept donations of these items pertaining to the Hagerstown & Frederick and its predecessor companies for preservation and research purposes. Please not that the HFRHS does not appraise items and values for tax purposes must be determined by a licensed appraiser prior to donation and at donor cost. 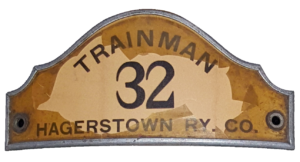 If you or a loved one has a collection of artifacts you would like to protect in the future, we encourage you to bequeath them to the Hagerstown and Frederick Railway Historical Society, Inc. Any donated items that are not able to be used or preserved by the Society will be transferred to another organization that can make use of those items or used in a manner that will aid in better preserving items retained in the archives. To inquire about making a donation, send us a letter or a message through our Contact Form.